Now time is coming to look at the main course of the menu I mean the watches which were presented at the 2019 edition of Baselworld. I will write a quick report per main brand before doing reviews in more detail of the watches that I like the most or which deserve a more precise analysis. In the meantime, here is my selection, inevitably subjective, of the 15 most attractive watches in my eyes. To make this selection, I only considered brands that were officially in the Baselworld fair and not those that were around (at the Hypérion hotel for example). Overall, I found the content of this edition very good. LVMH, as a whole, was dynamic and strong. 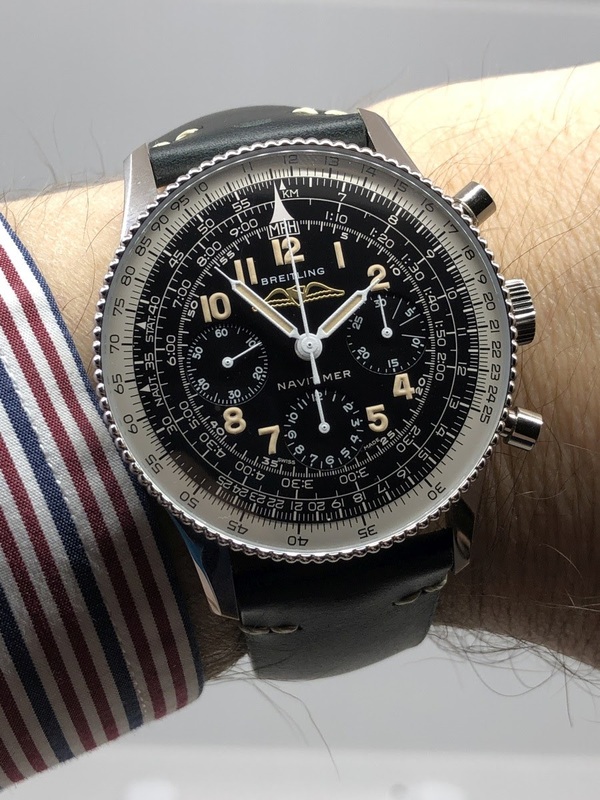 Breitling really liked me and seems to find the right tempo. Rolex has done Rolex, staying in its guideline through unsurprising products but well thought out. Tudor, as usual, combines "talking pieces" with volume products with a strong focus on specific markets. Chopard has unveiled watches there not more surprising but well executed and refined. As for Patek, if the Alarm Travel Time has received many comments, the other novelties have been very cleverly developed. 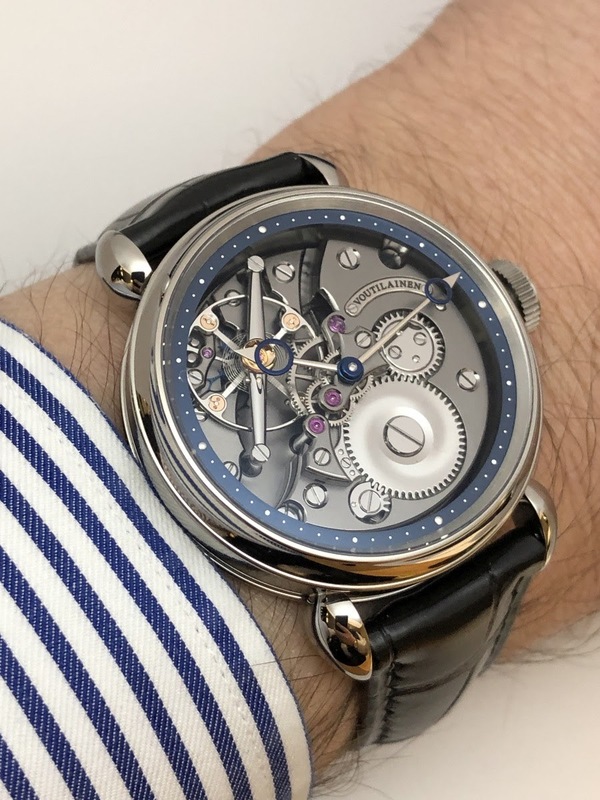 Now, it is obviously more from the independents side (Les Ateliers, AHCI or Watch Incubator) that surprises and daring attitudes were coming. Some have really done well and it is always this aspect that makes Baselworld so attractive. Even if the number of exhibitors has decreased considerably, there are still enough to experience beautiful emotions. 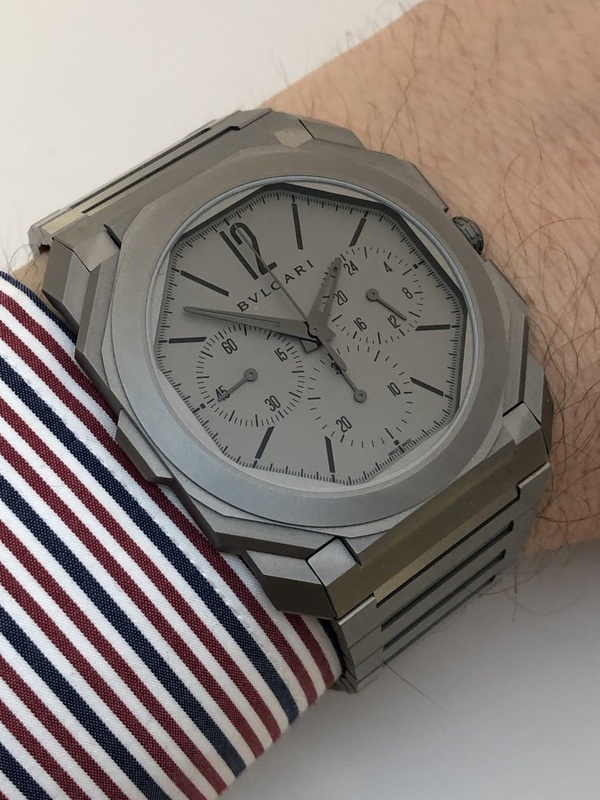 Finally, I found that the 2019 edition was also interesting from a mechanical point of view: the thinnest automatic chronograph movement for Bulgari, the Defy Inventor and its 18hz frequency for Zenith, the 26-330 caliber based on the 324 for Patek Philippe, the integration of the Isograph hairspring in the Autavia movement for Tag Heuer, the unveiling of an in-house movement for Chanel, it was a packed edition! Here is the list of my 15 favorite watches. At Bell & Ross, if it works, don't fix it. Here is the new version of the Bellytanker chronograph with a bronze case. The combination of colors suits it (it is already nicknamed the John Player Special! ), gives a refined and elegant style and the neo-retro atmosphere works perfectly. A real aesthetic success. This watch is not inspired by a model of the past: it's more than that, it's a clone. And I must salute the work done by the people who developped this piece because there is practically no compromise. Even the differences in hand thicknesses have been respected. The watch is beautiful and quickly became one of the stars of Baselworld. And another record for Bulgari! Indeed, the movement that powers the Octo Finissimo Chronograph GMT is the thinnest of its category. But the essential is elsewhere. Thanks to the Octo Finissimo collection, Bulgari develops a brand identity and has a seductive and clear aesthetic guideline. And since this chronograph has the good taste to display a second time zone, it could not be forgotten in my selection. 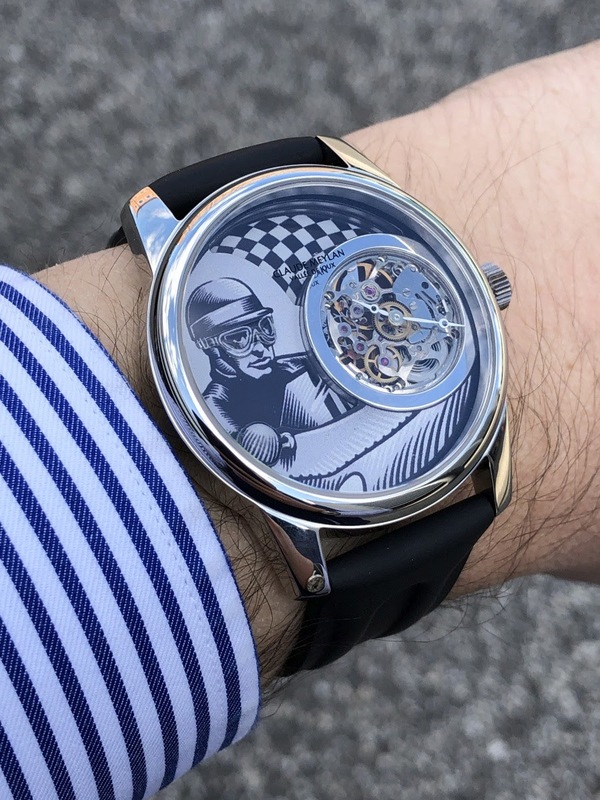 Claude Meylan reuses the same recipe than last year with Heidi and Peter (a decorated surface around a skeletonized movement ETA 2512) to present 3 watches celebrating the golden age of motor racing. I particularly appreciate the one with the pilot whose retro design corresponds to the spirit of the watch. A watch with an old-fashioned charm. 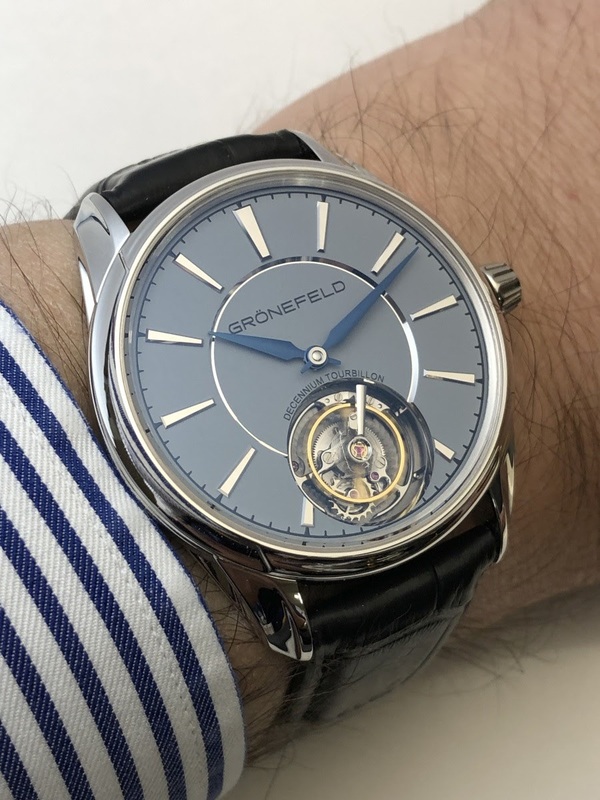 The Grönefeld brothers come back to their first love by offering a tourbillon watch to celebrate their ten years of activity. But this time in a simpler aesthetic context that allows them to be on thz same page than with the other 1941 watches (Remontoire and Principia). The outcome is classic dial side and beautiful movement side. It's the epitome of what classic independent watchmaking has to offer. 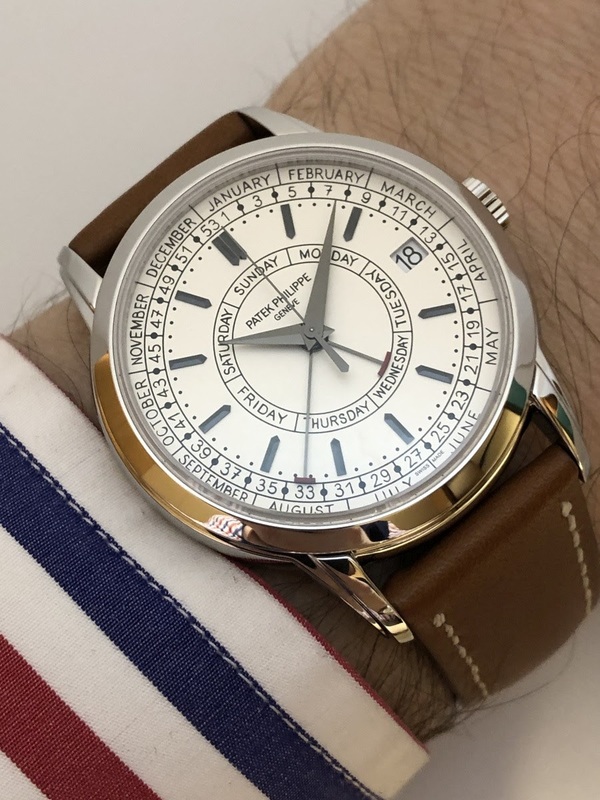 Patek Philippe puts on stage the display of the rank of the week with the Calatrava Weekly Calendar 5212A. I really like this watch for several reasons. Its dial is very busy but well organized. Its case is made of steel which is pleasant and rewarding in the context of Patek Philippe. And even more importantly the watch is animated by the movement 26-330 which is an evolution of the caliber 324. 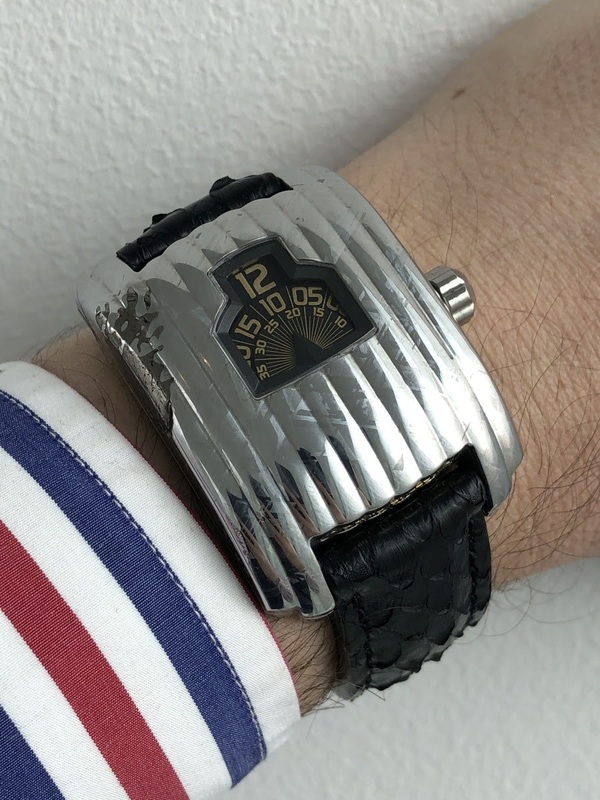 And just for this important point (I can imagine that step by step it will replace the 324 in other references), this watch deserved to be distinguished. The Hydrosphere is a very important watch for Reservoir. Because it must demonstrate, already, that the brand is able to renew itself. The mission is completed. The watch is successful both from the technical and aesthetic points of view. The Reservoir style is reflected in its display and the design allows the brand to explore new territories. And then, the Hydrosphere is a very original diving watch what is never easy to create and develop, the constraints of the genre being multiple. Obviously, this watch is not the most singular of the selection. But it is important to emphasize one point: the new diameter of 42mm fits it perfectly. Why? 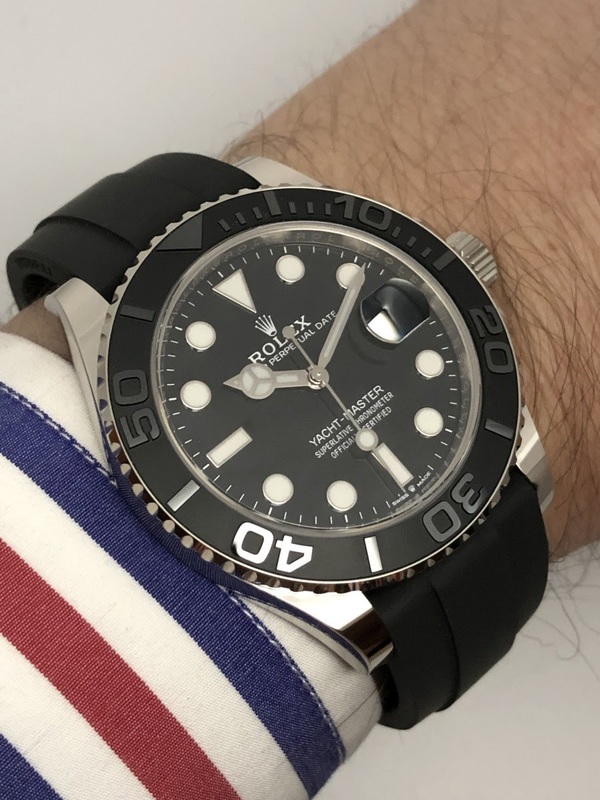 Simply because the black dial and the thick bezel reduce the perceived size. I find this watch, in white gold, now more balanced and I appreciate it a lot for that. I don't know if Schwarz-Etienne celebrates the 70s or if some unknown substances have had some side effects. 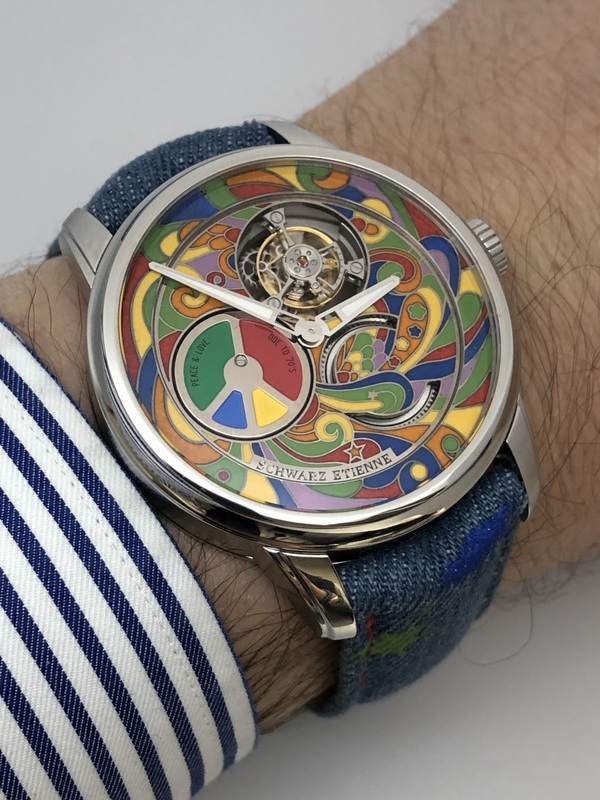 In any case, the dial of this tourbillon watch wins the Palme of the most psychedelic rendering. It is a joyful mess but the whole doesn't lack charm. And the quality of the movement is an extra asset. 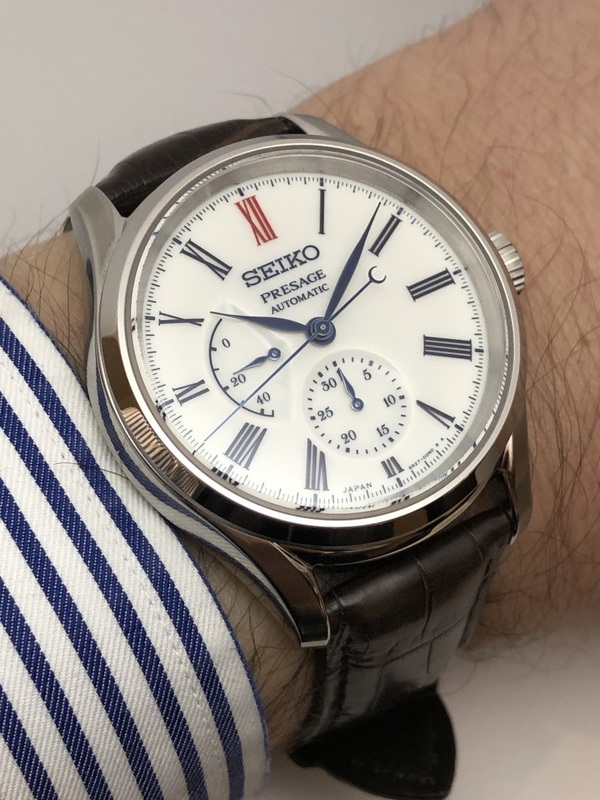 Seiko presented two Presage watches with Arita Porcelain dial. I like a lot the power reserve one because it has two assets: it has no date so there isn't any opening on the dial. And it has very beautiful relief effects. As always with Seiko, the quality is excellent considering the price tag. A very nice classic and reasonable watch. 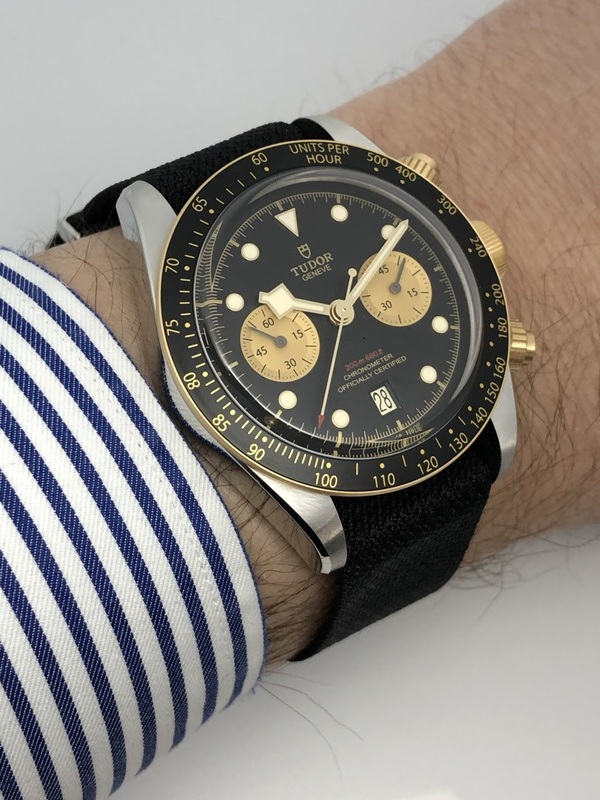 Tudor offers a very nice chronograph with the Black Bay Chrono S & G. The watch takes full advantage of its bezel, pushers and crown in yellow gold to define an energetic and elegant style without falling into a too ostentatious side. The quality of finishes is excellent and the watch is very attractive. The problem with the beautiful handwind movements is that we would like to have them permanently under the eyes and so we would have the secret wish to wear the watches upside down. Kari Voutilainen solved the equation with the Twenty-8 Inverse. And boom, almost everything ends up on the dial side to make us enjoy a wonderful show ... while still being able to read the time! 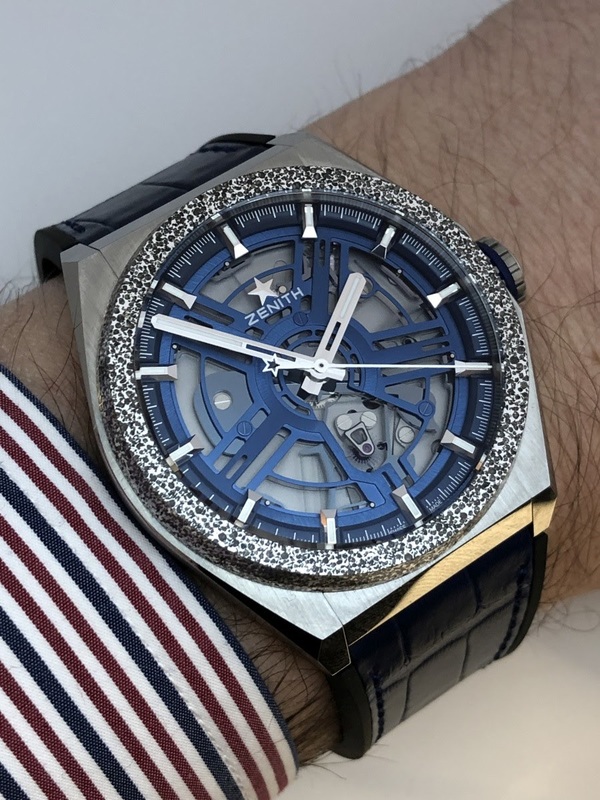 Zenith didn't have the right to fail after the launch of the Defy Lab. Here is the "catalog" version of this Defy Lab and the good news is that Zenith went even further. The frequency increases to reach now 18hz and some details of the movement have been redesigned for a better reliability. The potential of the technology is considerable since the increase of the frequency gives the proof that there is a reserve of energy which will be interesting to use with complications. 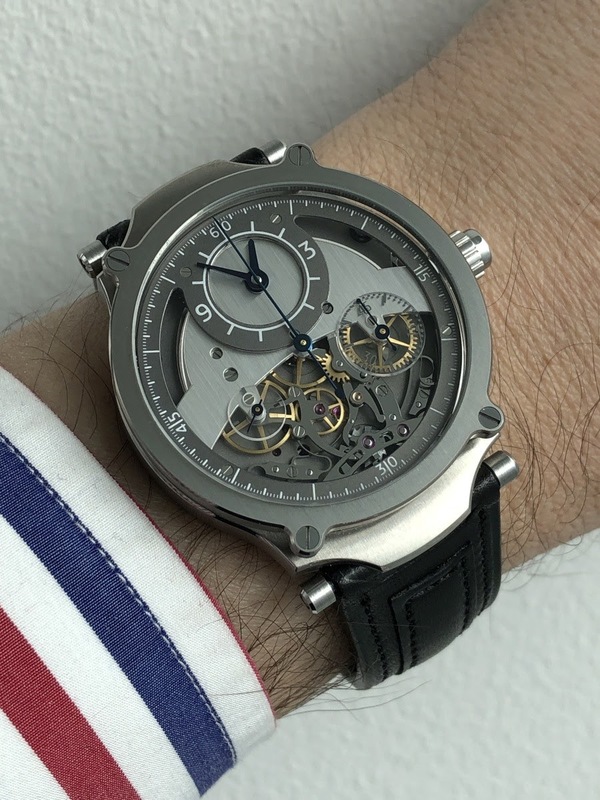 Sylvain Pinaud exhibited at the Watch Incubator. And it's one of the reasons I love Baselworld. His ChronographMonopoussoir is a marvel. At first I am seduced by the aesthetics of the piece. 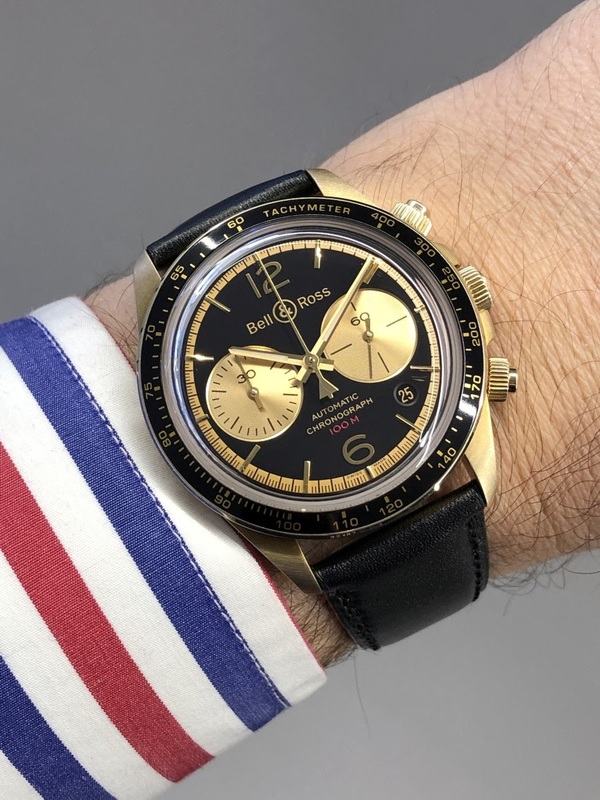 But the perfect feeling brought by the use of the pushers of the chronograph, soft and precise at the same time, proves that Sylvain Pinaud has designed a successful watch and he achieved this outcome startin from a few parts of an Unitas caliber. A true revelation. David Rutten was also part of the Watch Incubator exhibitors. And there too, it was a full surprise. 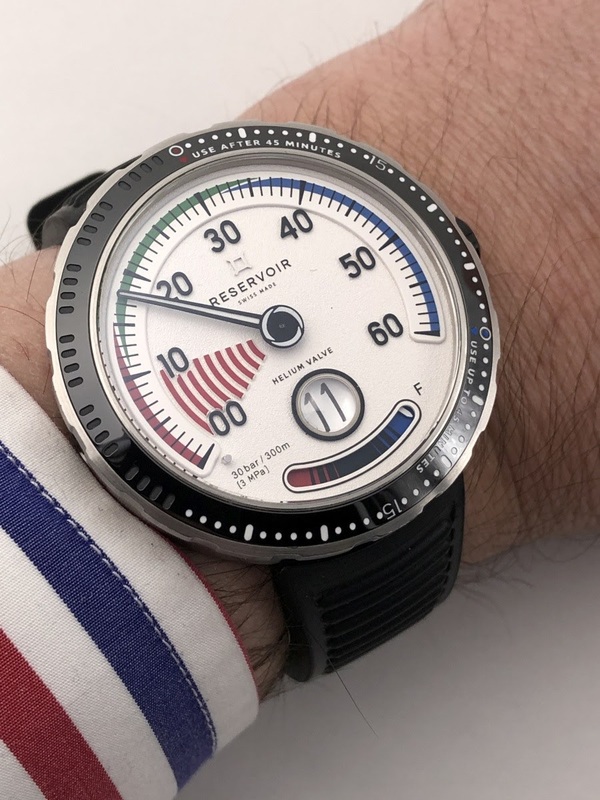 The Streamline DR01 is perhaps the strangest watch of Baselworld 2019 which makes it obviously exciting. The case is crafted from a meteorite stone and the exclusive movement which size is consistent with the case one features a jumping hours display. The very streamline design works perfectly with the case material. I even come to wonder if this watch didn't fall directly from a flying saucer. I would have the opportunity to come back on some watches of this selection (and some others!) in the coming weeks. I think that Zenith is pretty ugly. Great summary! my pick goes to the Zenith defy inventor personally!